Every month the moon passes between the earth and the sun as it cycles through its phases. Conjunction, the moment the moon crosses the earth-sun line, could bring a solar eclipse but rarely. 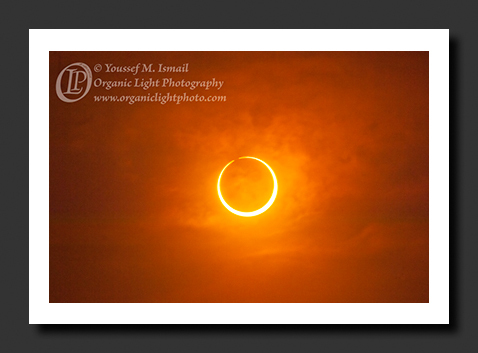 Rarer yet is when the eclipse is annular as was the case depicted here. It was awe inspiring, to say the least, watching the sun and moon move thorough the sky together for the few brief moments of totality as if they were wed together in a ring of light. And then in an instant that ring was broken and they moved on along their own separate paths in the sky. A passing harmony in the sky each the opposite of the other but united in obeying the laws that govern their motion. We could learn from that.